Platters include your choice of meat, 2 (8 oz.) sides, sauce, and 1 dinner roll or 1 piece of cornbread..
Our Smokey Tender Ribs comes with your choice of our house made Regular, or Spicy BBQ sauce. Want side items? Select your side and portion size. If you selected a combo or platter choose your included side items. Sandwich Combo or !/2 Rack of Ribs includes 1 (8oz.) side item. Platter or Full Rack of Ribs includes 2 (8oz sides). Soups options change daily, call ahead to confirm the soups of the day. Not sure what to get someone as a gift; you know a person that's stubborn when accepting a gift of thanks, then offer a Boo-boo's Barbecue Certificate. 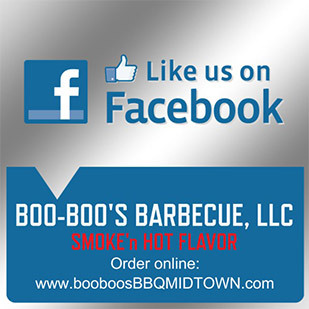 Lunch and Supper time Comfort Food to Go: Smoked Brisket, Chicken, Ribs, Pulled Pork and more! Or that Perfect End of the Day Supper! Enjoy the "Smoke'n Hot Flavors". We are located just east of the Susquehanna River north of Forster St on N. 3rd St. You can order online for carryout or delivery!